The University of Tasmania and Engineers Australia (Tasmania) have hosted a series of engineering workshops around the state designed to bring together local industry to collaborate on issues facing the sector and ensure Tasmania has a strong engineered future. The workshops themed “Engineering – an enabler of Tasmania’s future prosperity” were held in Burnie (26 September), Launceston (27 September) and Hobart (28 September). 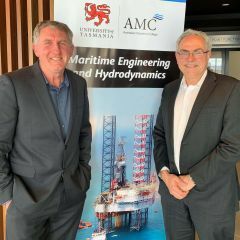 College of Sciences and Engineering Executive Dean Professor Brian Yates said the three events marked the first industry engagement activities facilitated through the recent partnership between the University of Tasmania and Engineers Australia (Tasmania). “The leaders within our Tasmanian engineering enterprises face increasingly important strategic decisions if they are to remain competitive in a globalised economy,” Professor Yates said. “Attracting and retaining a talented workforce will be a key driver for realising our short and long-term aspirations. To maximise our competitiveness, we need to build a culture of networked innovation in which Tasmanian firms work collaboratively to pool their strengths to access local, national and global opportunities. Engineers Australia (Tasmania) General Manager Dr Vicki Gardiner described engineering as an enabling profession that was critical to solving challenges facing Tasmania and Australia. “Engineers Australia exists to promote the science and practice of engineering for the benefit of the community and is very excited to be working with the University of Tasmania to host these workshops as part of delivering on our recently signed Memorandum of Understanding,” Dr Gardiner said. “The conversations at the workshops have been open and frank and very positive between everyone in the room. A collaborative approach will ensure that the best outcome is achieved.